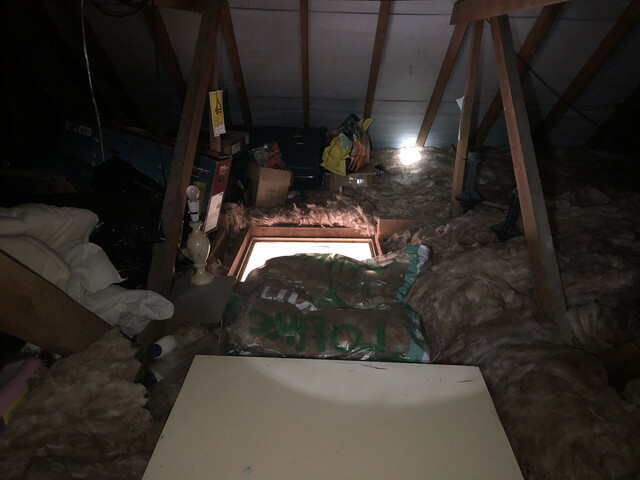 As I mentioned in some of my previous thread's, i'm starting a loft layout. 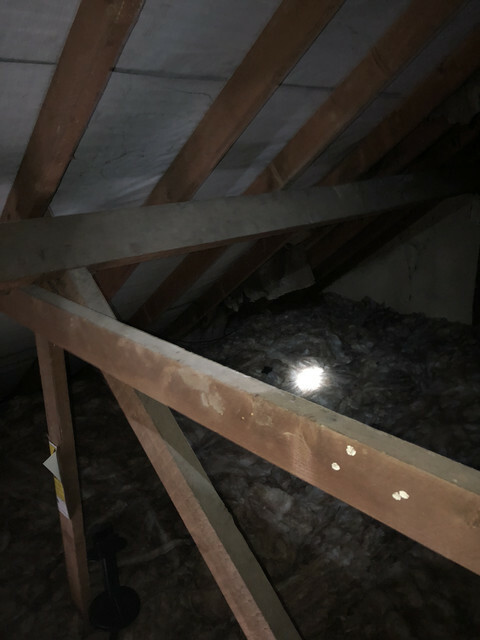 This will follow my process through the planning stages, and then my construction thread may run along side this as I cover the work that's done in the loft. I'll continue to plan while the loft is being done. I don't have any pictures of the loft yet. I was up there today, but left my phone out of my pocket when I went up, d'oh! But I have drawn a crude image of the rough layout below. The red area's are where I physically cannot go. 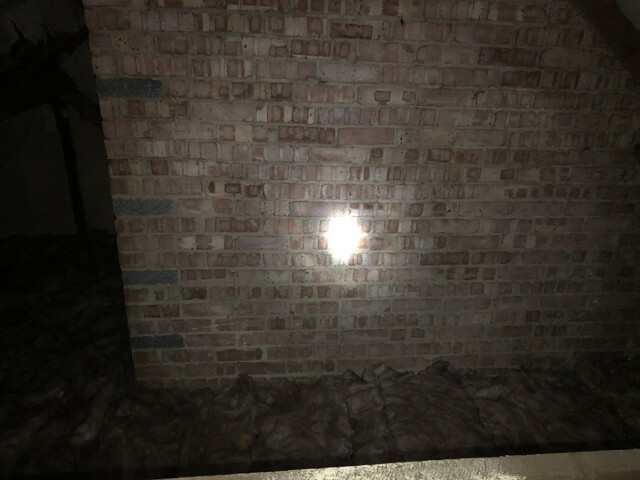 On the left, the large red square is actually a brick wall, and this area is part of the neighbours house/loft for some strange reason. So, my loft is a strange L shape in a way. The red square in the middle is the water tank/heater/things. These will be unmovable and will remain. 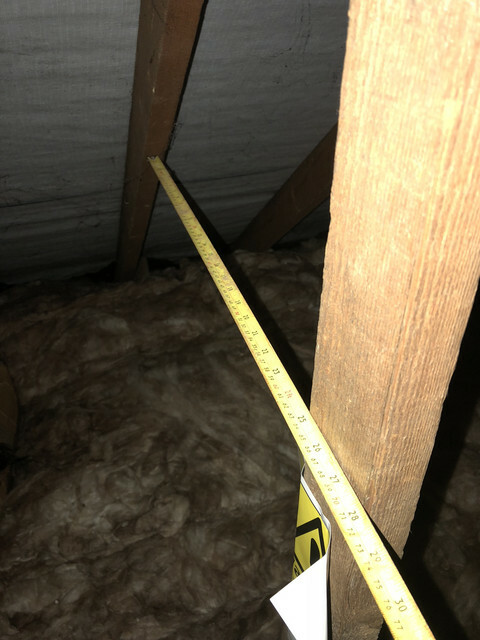 The thin red bar is a beam about waist height, but is not really an obstacle, and could probably be used to attach a base board too. Lastly, the small red square is the loft hatch. Now, that leaves me with an area pointed out by the green arrow. And yes, I know that it seems like i'm not able to use most of the space, but having been up and stood in there, I do actually have a reasonable amount of space. I'm yet to get an exact measurement (I'll do that tomorrow), but it is roughly 10ft x 6ft, and then I can use the side area as a potential fiddle yard, or some kind of storage. So, that's my plan for the space. I will be installing lights, power and then boarding out the floor this week hopefully. Just having to wait for the father-in-law to assist with the electrics as he is qualified to do so. Makes sense to get him to do it properly! In the mean time, I've been playing what to actually do with my layout. I started thinking (as you'll see in one of my other threads) about modelling something along the lines of the Tilbury line in Essex, and using some EMU's from the 80's and 90's. Having discovered that the EMU's I wanted are not readily made, and that I would have to construct my own ones, I thought about what other ideas I could do. I decided to step away from those particular EMU's and theme, as I am still fairly new to this, and would like to get some ready to go trains, instead of spending a very long time and large amount of money building my own. That is something I will probably do further down the line. But, for now I wanted to come up with something else. 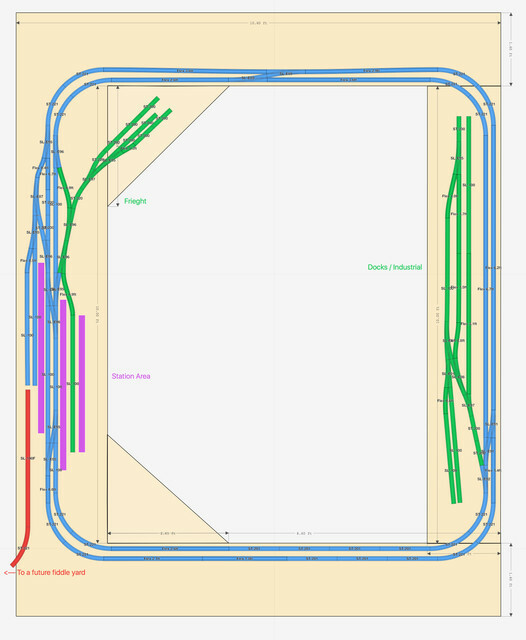 I've spent some time reading PECO Planbooks, and browsing online track plans, and came to the following decisions. 1) I want the layout to be able to loop. I don't want an 'End to End' layout. I would like the train to be able to continue round a loop in some way. 2) I would like some shunting ability. 3) I would like ideally 2 stations. And try to position them as best to simulate the trains going from one, to the other (in the limited space I have). 4) I want some scenery breaks, and some interesting scenes. So, maybe a freight yard, loco sheds, some residential areas, roads, public spaces, shops. And so on. 6) Considering 2 levels of tracks. 7) Budget...let's try not to go too overboard, especially with xmas round the corner! So, I have either copied or adapted 3 plans for now. I may not use any of them, and I will probably design some more. But for now, I like the idea of these. Some very tight corners, but some elements I wanted are covered in this design. I did think about raising the smaller station, but unsure. 2) 8ft x 4ft - End to End with a LOOP! This one is probably my favourite of the three. Its effectively an End to End, but with a loop in the middle. 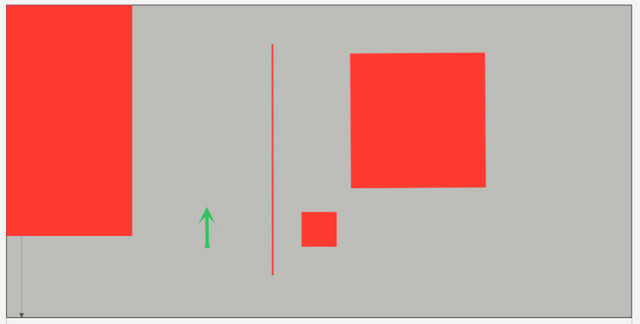 The blue area is 0.4ft high, the red and orange are at baseboard level, and the green climbs from the red upto the blue. At 4% apparently. I will probably enclose the red area, so it can't be seen. Where the red goes under the blue, i'll tunnel it, and then have another tunnel just after the green track starts. So the train will appear from the rear of the scene and come forward and pull into the blue station. Where the orange tracks goes off to the left, i'll probably make that a entrance/exit for a fiddle yard or similar. This is pretty much a direct lift from the PECO Track Plans. However, it was an ambitious scene that I liked, and was considering challenging myself. Making this more of a long term project. For those that are unfamiliar with the layout, the blue area is the station, green is a town area. The red area will be the town over the top of the 3 loops, leaving one visible track infant of the town scene. And the orange track is a freight yard, with a viewing area in the middle. This does have me tempted, but think i'll need to double check the available space before even considering this one properly. I've designed these in RailModeller Pro, and have used PECO SeTrack and some SL-100 Flexi Track too. In terms of what trains I want to run? I think I want to stay in the 80's/90's but may even consider the 00's and something a bit more modern. I'd like to run EMU's/DMU's and passenger trains. I don't want anything too long with large amounts of rolling stock at this stage, as I think the layouts will probably be too small for those at this time. As I expand and grow the layout, so will my trains and rolling stock. I want a few Diesels and shunters too for variation. But, at this stage i'm still quite open minded about it all, and open for thoughts and suggestions. So, it's all still early stages and messy thoughts at this time. But i'm happy with the direction i'm heading. I'd be very grateful for your thoughts and opinions on all of the above. 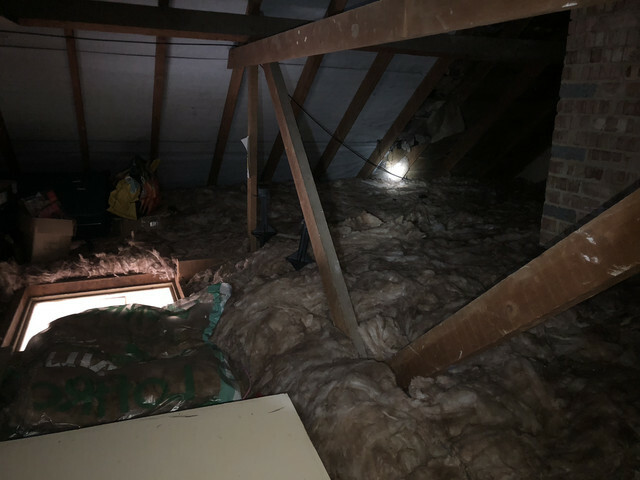 I have a bit time to get the planning sorted, as the loft will take a little while yet, so I can focus on getting it right in the planning. If you've made this far, I thank you! Would a design based on this idea help? Obviously you will need to adapt it to your needs, and it has a reverse loop so would need wiring consideration... But it is a nice concept as it has out and back to a terminus and a loop for a good run. I didnt draw it for this use, as I drew it to help another person, but the idea may work with your plans. Hi Kavster - Some things to consider before planning. 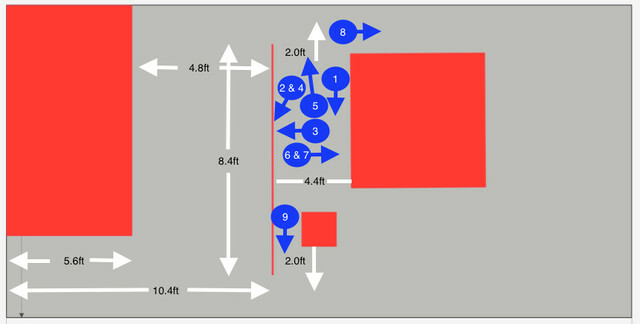 1) Access - a couple of your plans feature 8ft x 4ft solid boards, have you got access to all sides of the board? If not then you will have big problems if you need to get to the back of the layout to clean track and fix derailments. a reach of 2ft should be your aim to access all parts of the layout. 2) Radius - steer clear of first radius curves, they will cause restrictions on what locomotives can run without problems. 3) Try and avoid stations on curves, particularly with tight radii, the big gap between the platform and the stock just looks totally wrong, I have a couple of curved platforms but these are on 26" radius curves - they still don't look great. Think about putting the layout round the outside of the loft as several modellers (and I) have done, you could get a good log run of plain track away from the area you want to shunt in. Mountain - Thanks for the idea! I was actually going to consider a reverse loop, but was a bit put off by the wiring. I've done a quick bit of research and found that there are quite a few good options out there actually. So, I think I will definatley consider putting in a reverse loop now! luckymucklebackit - Thank you for your advice. For your first point, access will be tight, but manageable I beleive. It wont be a viewing or operating space, but would allow me access for maintanaince. I will be doing an accurate measurement of the spaces today when I get a chance to confirm this. Your second point, I'bve heard 1st radius curves are not ideal, but was working with the available space. Maybe I need to make some sacrifices and restrict myself to 2nd radius at a minimum. Your third point, I agree with that. I think I was just being gung ho and putting in a 2nd station just because I wanted one. I do like plan 3, but wonder if it is too costly overall, and whether I should do something smaller with the intention of expanding the baseboard area in the future, rather than trying to fit everything all in one go (albeit over a longer period of time). 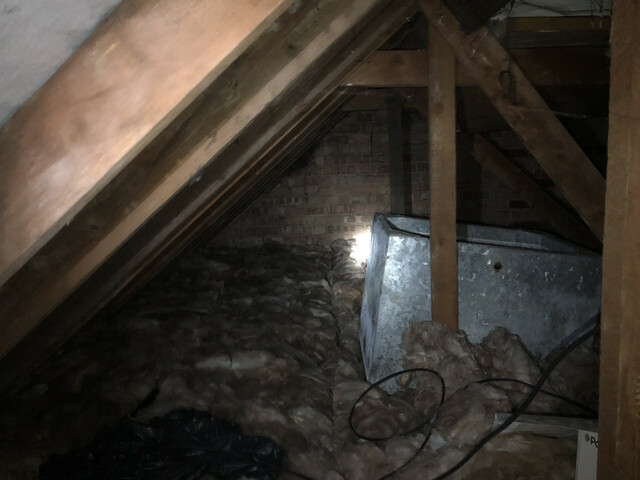 I do originally intend on doing a full run round the entire perimiter of the loft, much like many others. However, having explored the available space, and the water tanks being slap bang in the middle, it does limit my options. I may be able to consider a U shaped run, but then I am worried about it being a pure end to end layout. Maybe I could stretch out plan 2 and make a U shaped end to end with a loop in the middle section? I will work on some more plans today if I can. Think i'm going to acuaratley measure the space I have and then do some plans! Thanks again for all your input! Ok, so I managed to get some photos and take some measurements today. I've added them to the crude floor plan, and have attached photo locations to try and help understand where each photo is. Let me know if theres any confusion lol! I havent had a chance to create any more track plans today, BUT, while I've been out shoppping with the mrs, I managed to get a few bits for myself too. Including some more track plan idea magazines, and some more bits and bobs for the loft! Father in law still hasnt been able to do the electrics yet, but as soon as that's done I can get moving quickly with the rest of it! Hopefully you'll see why I can't really do a full layout round the outside of the loft, there just isnt the room/access to really do that. But, a U-Shape is a possibilty still? I'm still leaning more towards a rectange or maybe an L though. Lastly, the 2ft measurement at the top and bottom is explained in picture 9. It's the measurement from about the height I'd want the baseboard up to the beam. Any thoughts and ideas are greatly welcomed and appreciated! Kayster, I've been having a think, and a play on Anyrail to see what might meet your expressed preferences. Modern image doesn't help limited space very much as the passenger stock tends to be long, and the freight mainly in long block workings. R1 ought to be ruled out, and R2 only used if really needed. If the main line haulage will have 8 wheel pick-up this is not so important for stalling, but an 08 slowly shunting sidings will be well-pleased with live frogs. Having said that I've taken the smallest of the sizes you showed, 8x4, and seen how far I could go towards your aims. If there was more space (even a foot each way) 2nd radius curves could be eliminated and at least some of the setrack points. One level, one station. This will hold 4 coach trains without difficulty. Twin track ovals, R3, R4. The trailing crossovers at either ends of the platforms allow an EMU or DMU to terminate and reverse and go to correct line running. Freight will also need to be reversed this way on the outer track. Brake vans will be a pain, but not impossible. The yellow section is an optional loco-layby which could be handy for loco exchange. Now, the inner track. There are two good EMU /DMU sidings 1 4ft and the other nearly, so these could be trimmed back to suit your longest 4 car set, or pair of 2 car sets. trains are able to leave at the end of this for clockwise running. Expanded this could have a central operating area, lose the 2nd radius, have better points and have the potential for introducing a high-level terminus. "It's his madness that keeps him sane." Thank you very much for your detailed reply and ideas! I was thinking of doing electrofrogs to begin with, I know they're a bit more complicated to wire etc, but thought they would be better and give me more options. I have already accumilated some Peco track, and the points that came with are insulfrog, but was planning on buying electrofrog points seperatley anyway. I do like the layouts you've created. Can you confirm that the station described is the brown building in the centre, or the grey curves on the left? I've interprated it as the brown building from how you've described it? And this is a reverse loop that would need wiring appropriatley? 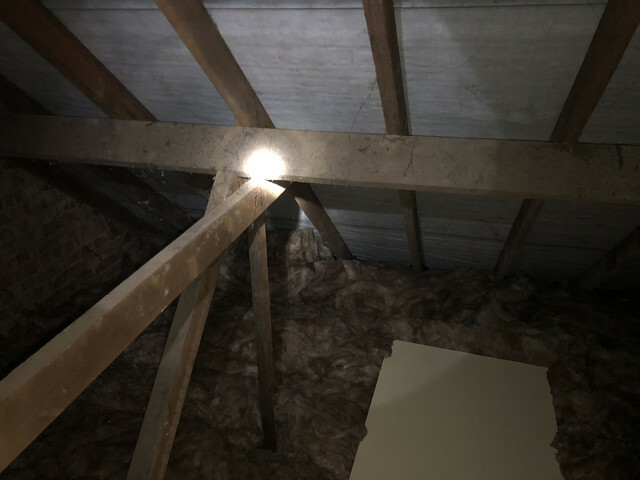 I think once i've got the loft actually done, I should be able to try and squeeze a bit more space here and there and hopefully find a foot either side. But, I'm only so good at Tetris haha! I do like how it's incorparated the reverse loop that Mountain suggested also, and how it's close to my 3rd design. So, thank you again. I will be seriously considering this. The platforms are the grey curves on the left, shown with small; platform buildings. Some removable track covering upper right might work as well. The brown central building was a suggested two-road diesel shed. There are several ways of wiring a return loop without great difficulty. If the layout gets any larger it may well disappear anyway. On a layout with diesel locos it's not really for turning locos: here it helps give the best goods siding access and arrangement. So I havent really got a lot to put in this update, I've been so busy with the actual loft build and day to day life I havent made much progress on the layout design itself. However, I have made a few decisions and purchases which I wanted to update on. So, in terms of my 'theme' and period of the layout. I wanted to do something around the Tilbury line in Essex but explained why I wanted to step away from that. But, I was at a model railway show and came across the Network SouthEast Railway Society. I had a good chat with them there and picked up some literature, including a book on which trains ran on which lines. It really made me want to find a way to run something in this area and era. So, I just decided to make a decision to go for it. Model railways for me is about enjoying it and having fun. Yes, I know some people will beleive that it should be modelled perfectly to scale, and that if it wasnt there at the time it shouldnt be on the layout, etc. But I've decided I'm going to create fictitious layout, where it's not too far fetched, but maybe not exactly to reality. I wanted to run Network SouthEast as that's what I grew up with, and as I mentioned in my welcome thread it is the memeory of doing this when I was younger with my grandad that makes me really want to model the area. I also want to incorporate some of the Kent side of things, as that's where I'm based now. I'm also going to be running a freightliner fleet as I do remember those trains running through the Tilbury line. I want to model some kind of freight area, and again, will be using some of that good ol' creative freedom! So, that's what I'm going to do. It's going to be fun and enjoyable and give me some creative freedom too. I'm quite looking forward to it. 7) Dynamis Ultima DCC system - I've done a bit of research on the various controllers avaialble, and I settled on this one as I found it will suit my needs and give me plenty of options in the future. I've got some time to learn it over the next few months and experiement with it too. 8 ) Lots of Peco SL-100 flexi track. I'm not buying points yet until I know exactly what my layout plan is, but I found quite a lot of this for a good price so seemed silly not to get it really! I've also got a few other bits and bobs that I've been picking up along the way that I will need, like TrackSetta's and fish plates, rail cutters, and all kinds of wonderful modeling materials. 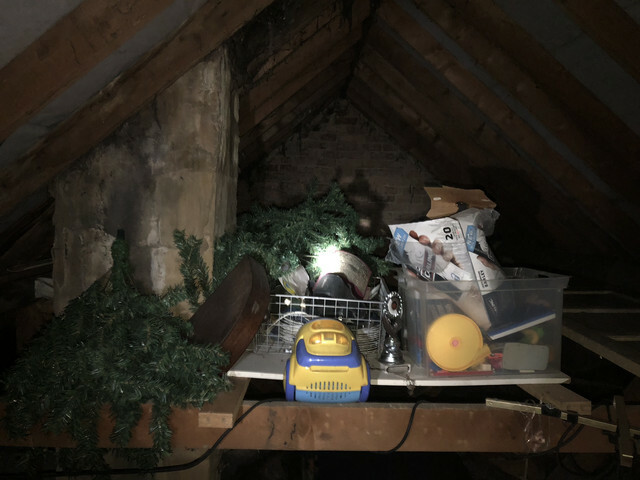 I'm going to try and make some more progress on the final design of my layout, but I've found that with the loft build, some of the space that I didnt think was available, is actually quite useable. This has given me different thoughts about what to do, and been setting me back to the drawing board essentially. 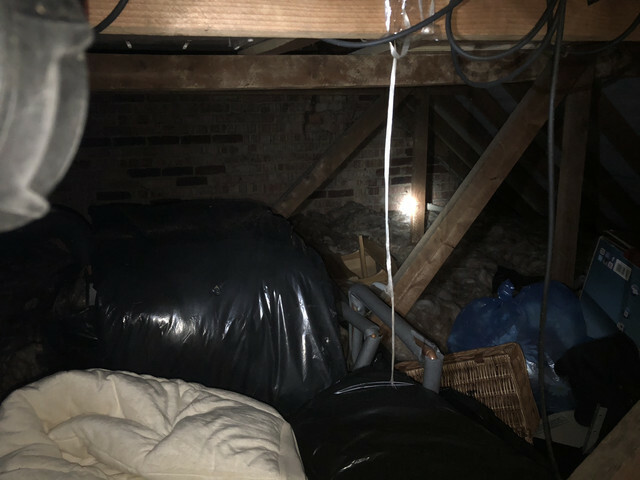 At the moment, I think I could quite easily have a run around and through the middle of the loft, giving me plenty of more design options. I'll put some ideas together soon and explain what I mean in my next post. Thanks for reading this and all of your input so far! Maybe also a NSE DMU will also look the part? Looks like you are getting a nice collection there. Mountain wrote: Maybe also a NSE DMU will also look the part? Looks like you are getting a nice collection there. Yes, I was thinking that. I’m debating what to go for though st the moment. It will probably have to wait for the new year for money reasons. But I was going to consider the upcoming Bachmann Class 414 2-HAP EMU in NSE also. Any suggestions on a good DMU would be greatly appreciated! Bachmann class 108 is a lovely model and they did one in NSE livery if I remember correctly. The only thing is they do fetch high prices secondhand even on eBay. The 108 does need two decoders. I fitted two standard Bachmann loco 2 or 3 function decoders in mine and put the power and dummy to go on the same address. The Bachmann decoders were a good choice and they have a dimming function for the internal lights, which looks impressive in operation. Thank you, I shall look into that! 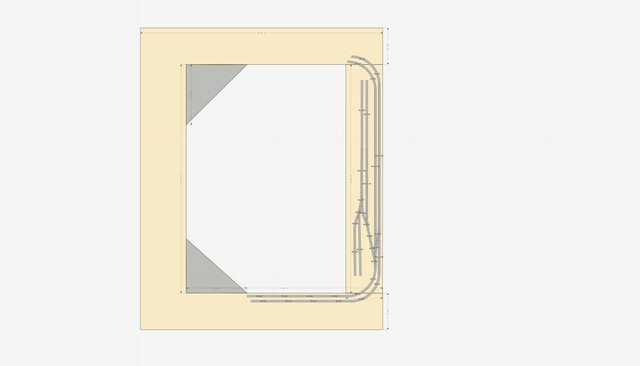 Also, I have now created the baseboard shape design, which I think has given me much more options. However, I'm now completley at a loss for designs! I've uploaded a high res picture so you can all see the dimensions labled. I'm just struggling to come up with any sort of design i'm happy with. 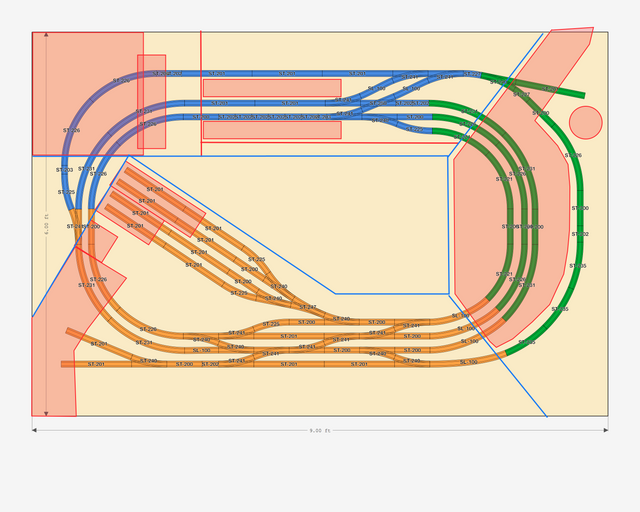 The track you can see pictured will be the mainline loop, and then the potential dock/TMD/freight/industry area. Tha leaves me with a large area for main station and scenery etc. Any input that anyone can give me would be GREATLY appreciated, and track design ideas are most welcomed! Haha! However, points 5 & 6 now are not valid. I'd appreciate peoples thoughts and input on this. There's no doubt some errors and room for improvment, but bear in mind that i've just used various peices of straight track to fill the gaps quickly. In reality I'll be using flexi track and cutting it to size. 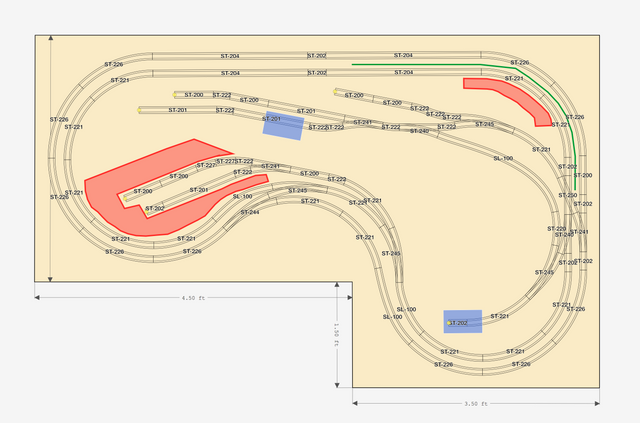 I'll be doing the curves in flexi track too with track setta's. 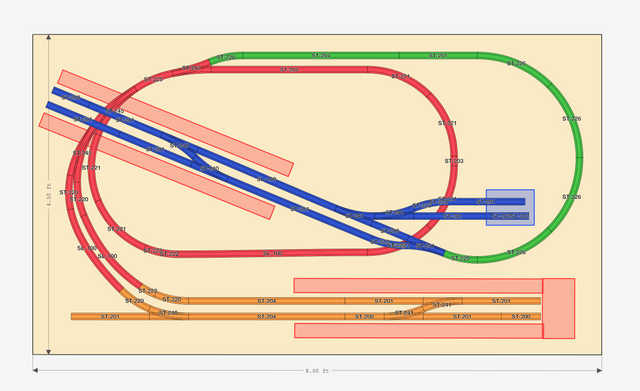 I just wanted to get the correct radius for the planning software, so used SeTrack in the plan. On the right hand side will be the dock area. Just a small two track straight with an unloading platform in the middle.Then a run around track for shunters and engines. I've also included a two track (head shunt?) which I may have some kind of fuel area too. Really leaving that open for options right now. On the top and bottom are just the loops. Can't really fit anythign wider than two tracks in there. The base board looks wider, but it'll be running along side the sloped roof, and under a beam. Giving me plenty of room for two tracks and height clearance for locos, but three is just gonna be too tight. Then on the left is the main station area. I've made it quite a large station, and have inlcuded an option for some kind of small freight, TMD or maintance area. Again, just giving myself options here. On the furthest right hand side is a red section of track. Right now it's a siding, but I'll give myself the option to add track here and run into a future fidle yard of some kind. I like to think I've left myself enough baseboard for scenery and buildings, but I would greatly welcome thoughts and ideas on this. Whether it's reducing the amount of points, or how to acheive the same goals in a better way, or anything else that I may have missed or not thought through properly. Excuse the rough overdrawing of your plan. Just 4 ideas from me. 3 - Add another point to be able to get into the fiddle yard at both ends of the station side. 4 (NOT SHOWN) - If you decide to come off the lower straights into the fiddle yard (second part of idea 3) I'd suggest a cross over on the straight main line tracks as well so trains coming out of the fiddle yard can change tracks almost immediatly, thus negating the need to clutter the fiddle yard with another set of points just to change tracks. You'll probably want that space in the fiddleyard for a run around loop at least. I'd put this crossover closer the the left of the plan unlike the top main lines crossover which sits in the middle of the upper tracks. Hope that all makes sense?